I’m getting ready to do some major remodeling and redecorating of a couple of rooms in my house. In order to prepare a staging area I’m working on cleaning out my ‘leave it’ room as in “I’ll leave it in there and do something with it later.” Some of those items have been sitting in the same spot from when I moved in ten and a half years ago. That includes my vinyl record album collection. It’s not a huge collection. Everything would fit into a milk crate which is where I think I stored it till I switched to a more fashionable silver mesh container. There are 74 albums altogether with 23 actually belonging to my sister Kathy and another five that belong to my parents. Yes, I said my parents. That leaves 46 I purchased for myself. Going through them has been a walk down memory lane. Some of the albums still have stickers from where they were purchased. I have albums with labels from Harmony House, Music Village, and Musicland – record stores that no longer exist. I even have one labeled from ‘Hudson’s Record Dept.’ My fond memories for these vanished places are wrapped up with being a teenager at the time and getting excited about having enough cash to make a purchase. With limited funds, I had a method for how I bought my albums. It would have to contain at least three songs that had been played on the radio. That made the value of purchasing an album better than buying each song as singles. Rare was the artist that I liked so much that I would buy their albums with only one known hit song. John Mellencamp made that list. So did the Eurythmics and Styx. Often I would wait for an artist or group to produce a greatest hits album. That way I’d get the best songs and not have to deal with a bunch of substandard ‘B sides’. Almost all of the ones from Kathy are movie and Broadway show soundtracks. She has a penchant for show tunes and I enjoyed the songs and music as well. With her being twelve years older than me, she had significantly more funds to purchase albums and I could browse and listen to her collection at will. When I moved out, some of her albums came with me – probably with plans to record and then return them to her later. That didn’t happen because around that time, CD technology arrived and started to take off. Even an album proudly boasting ‘This record can be played on a stereo phonograph’ could not win against those glittering silver discs that reflected colors like bubbles. Virtually indestructible, CD’s soon overtook the market from the more temperamental vinyl even though most aficionados thought the sound quality to be inferior. For an opinion close to home, I asked my audiophile sister Camille what she thought. She liked the CD’s but noticed that the same song on CD dropped the sound of delicate bells she could hear on the vinyl version. My ears are not that attuned to such nuances, so I started buying CD’s and even bought CD copies of albums I already owned. What to do with the vinyl albums now? Great Western Themes (United Artists Records): Whoever picked the songs for this two record collection really nailed it. From Elmer Bernstein’s “The Magnificent Seven” to Ennio Morricone’s “The Good, the Bad, and the Ugly” these themes celebrate the spirit of the movie and TV western golden age. I like this album so much that I went on Ebay to buy it when the family copy went missing. I’ve never been able to find an equivalent on CD so it’s an absolute essential to keep. The Beatles/1962-1966 (Capitol): If you’re going to have a vinyl album collection, it might be the law that it contains at least one from the Beatles. Rumours by Fleetwood Mac (Warner Bros. Records): This was the bestselling record of my teenage time. A local radio station had a contest where if you were the ‘nth caller’ you could pick any album as your prize. I started to hear the boredom in the voices of the DJ’s as winner after winner picked this album. If I had ever made it through, I would have picked this album. Live Bullet by Bob Seger & the Silver Bullet Band (Capitol): You couldn’t live in or near Detroit as a teenager without having this album. It is a classic rock double album and still one of my all-time favorites. Pieces of Eight by Styx (A&M Records): If everyone left me alone in the house, I cranked up the volume on the song “Renegade” and repeated it over and over again till they were due home. Charade the Original Movie Soundtrack (RCA Victor): This one belongs to Kathy, but I might have to accidentally not return it to her. The movie is one of my favorite romantic films and the score by Henry Mancini is one of his best. The Best of Glenn Miller (RCA): I bought this when I stayed in Poughkeepsie, NY, for a college internship at IBM and actually had some spare cash to spend. If you like swing/big band music, I think you should have some on vinyl in deference to the historic 78 rpm record era. Queen Greatest Hits (Elektra/Asylum/Nonesuch Records): Like the Beatles, Queen is one of those quintessential vinyl bands that everyone should own. This album doesn’t have the classic cover art like their News of the World album, but you can’t go wrong with a greatest hits collection. Moonlight Feels Right by Starbuck (Private Stock Records): I scratch my head over why I bought this one. All I can say is smooth pop is nice every once in a while. I remember listening often to the whole album, though now the only song I know is the album’s namesake and Starbuck’s one hit. Who can get rid of an album where the xylophone is used for a rock solo, or where the band members are dressed in platform shoes and bell-bottom pants? Songs from the Big Chair by Tears for Fears (Mercury): This is the last vinyl album I purchased and I include it simply for that fact. Keeping it is bittersweet, but isn’t that what makes a vintage record collection worth having? Vinyl has a different sound and play. How can you get rid of any of them? From my brother, I claimed Jim Croce, Queen, The Police Reggatta de Blanc, Boz Scaggs, The Cars, Devo and more. Thanks big bro – you had excellent taste as a teenager. I would have easily guessed 5 of the 10 you picked. And only two were complete surprises (Glenn Miller and Tears For Fears). Others you played a lot that became favorites were Seals & Crofts, soundtracks from Star Wars and Swashbuckler, and Billy Joel. I held onto my own vinyl collection long after most gave up. The eventual extinction of my collection started when I regrettably accidentally left half of them behind a couple moves ago. They’d gotten mixed in with ones I found curbside and intended to sell on Ebay. Then when I recently moved yet again, I bit the bullet and tearfully gave up almost all of the rest due to space restrictions and not having the strength for to much heavy lifting (much like how I eventually let almost all of my book collection go several moves ago). I have about 6 left that I chose to hold onto. Maybe someday when I am more settled I will rebuild my collection from yard sale and thrift store finds. What memories. There is a lot of history in those vinyl records.I can remember not waiting for the albums and buying the 45’s. Good article. You sure that Beatles album wasn’t mine…ha. I’ll keep you in mind. 🙂 Ironically, when I was in Barnes & Noble this weekend I found a large section devoted to vinyl albums! When did that happen? 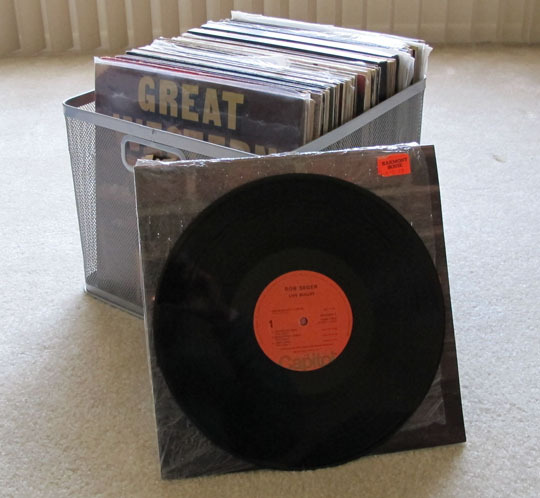 Vinyl has become hip chic and trendy in big box stores for about 6 months now. I think it kicked in last year’s holiday season. With the decline of physical media, collectors come out to savor nostalgia. And that’s how big box stores capitalize on the treasured.